To learn about our comprehensive FIT Process and the Fleet Feet experience, click here. To ensure sufficient time to fit you for your shoes, please try to arrive at least 15 minutes before we close. Map: Click here for a map and to get directions from your location. From East or West: I-84 to Exit 43. Turn left at the end of the exit ramp. Turn right at the second light (Main Street). Turn left at the fifth light (Farmington Avenue). Fleet Feet is located on the left just before the third light (across the street from Santander Bank - next door to SK Lavery Appliances). From Farmington: Route 4 through Farmington. At the intersection with I-84 ramps, turn left and continue on Route 4 to West Hartford. Now you are Farmington Avenue. You will pass the University of Connecticut Medical Center and Stop and Shop. 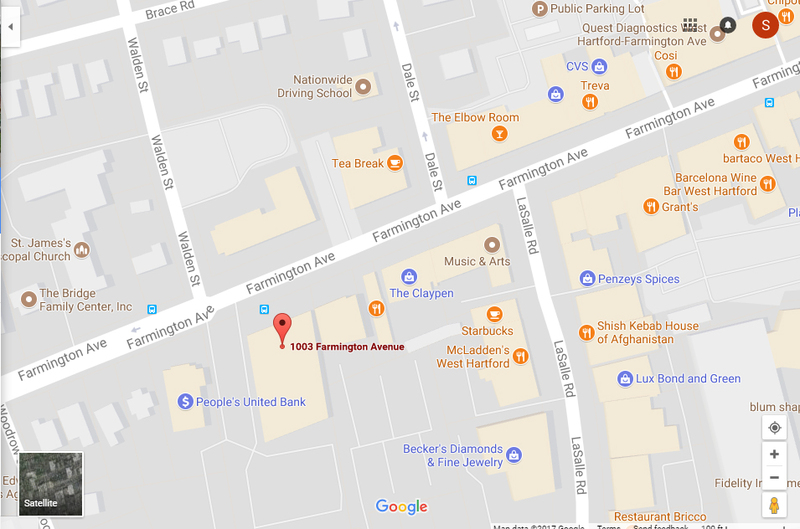 We are located in the first commercial building on your right after the intersection of Farmington Avenue and Mountain Road, across the street from Santander Bank. From Avon: Route 44 over Avon Mountain. Turn right on North Main Street in West Hartford. Turn right at Farmington Avenue. Fleet Feet is located on the left just before the third light.